When I say it’s for advanced users, I mean that creating shortcuts in the shortcuts app is meant for people who know how to program, or at least have some basic understanding of programming concepts. You can search the public library for existing shortcuts, and I think more technical users who have no programming experience may get benefit and use those quite well. Siri shortcuts (not the shortcuts app, but automating simple actions for spoken Siri commands) is probably more open to average users, but even then I think that most people will not explore it much. I’m not attacking you or your opinion on the shortcuts app. It is frustrating tho that Apple would release this with no particular guidelines or direction on how to use it...if my father wanted to use the shortcuts app for simple Siri commands he would struggle with it, and i consider him an average user. Please comment if I'm missing something here. Ok, I will search and check it out just to educate myself on this. I agree here. I actually have quite a handful set up but in reality I don't use them. Maybe just a couple of times because I can unlock face id and navigate to what I need quicker than sending Siri a command to do so for me... And I just don't use my phone at all while driving for safety reasons, but for someone who needs the Siri function (more than I ever would) would benefit quite well from this. Honestly I don't really even use Siri much at all. Well....a lot of us here are advanced users & some of us are still having an issue grasping this set up. I’m not new to any technology and have a pretty good grasp on a lot of stuff. I feel the app is clunky and not very straight forward as far as creating shortcuts. There’s too many actions that have to be put in place just for one shortcut to work successfully. As an unadvanced user with little programming skillz, I had hoped to see those who are post detailed tutorials with screenshots, arrows, and explanations. But all I see are ready made Shortcuts and links to sites with more of the same. Even some of the ready made Shortcuts are hard to figure how to use. Before Apple purchased Workflow, I set up speed dial number Shortcuts and added them to my homescreen. It wasn't easy, but I managed it. But creating a custom Shortcut from scratch is different. As soon as I tap on "create shortcut", I'm asking, "what next?". I'll just have to play with it and see what happens. A lot of trial and error. I’m not going to argue, but, fwiw, the shortcuts app is not installed by default. You need to get it deliberately, install it yourself from the App Store. And it is a lot easier to create a powerful workflow (if the shortcuts app supports your workflow, of course) than it is to develop an app yourself. And I could see a future where machine learning will make things easier in the shortcuts app eventually. Why can't you save images posted here? Well, that's probably no more trouble than using a shortcut. I don't know of any Shortcuts forum related. May be one for imgur. Do you not have an iPhone to use for images? I've noticed some of these Shortcuts don't appear on the today widget screen. doogald and Ledsteplin like this. Oh don't misunderstand my replies, I'm not looking to argue about it either. It just some actions of it are hard to figure out and put it chain of command. Yes I understand you need to download it from the app store as well. Honestly... When this first was released my first thought process was oh awesome an app similar to what launch pad was in blackberry ! While I do find it similar in some ways I see the other more complications it can provide. And with that said, I am still lost. Ledsteplin, ThePinkChameleon and Annie_8plus like this. Here is my script I run every morning. You need the main script which is the Good Day one, then you need the Today’s Schedule, Tomorrows Schedule, NFL quick view and the news scripts. Here's one to set a time for a delayed text message. I have not tried this. My bad... in my Good Day script, you need to fix one thing. I made a change before I posted and there is a variable mismatch for news. What might help is if Apple had a browser based Shortcuts "app" in iCloud like there is for Notes, or Reminders. That way users could log in to iCloud and use a full size screen/desktop browser on a laptop or desktop to design, "test run", and debug (if needed) Shortcuts. The online Shortcuts app would have in context help and guided hints or more intuitive wizards that may not be possible in the iPhone based app. Then once known to work as desired, the user could "push" the Shortcut to your iPhone's Shortcut app or import via iCloud. I'm like Pink and others above. Don't use Siri much (maybe I should), and even though I created a few Shortcuts (as posted earlier), I forget to use them. Perhaps because I did not see a way to get the Location logic to allow me to chose my home address, I'm subconsciously less inclined to create/use them, or because in my daily routines I'm not presented with a problem that requires solving with the Shortcuts app? (rhetorical questions for myself). And while I have taken programming courses, I promptly forgot most everything as I've not worked in developer roles. So maybe some consolation there as in my limited experience so far, getting the more complex Shortcuts designed, debugged, and working is probably not a "light switch" endeavor. Back to the suggestion above, I'd also add an optional psuedocode or natural language/regular expression design step feature. That way if you sort of know what you want to do, but are not quite sure, then you can write out the "rough draft" actions and order of operations which could be coupled with or part of the debug feature. How would I create a Shortcut that creates a Contacts vCard (vcf file)? I used to do this with a feature in the Appzilla 4 app. But it was 32 bit and had been removed from the app store. I can do it in the SA Contacts app, but a Shortcuts for it would be cool. What do you want the end result be? Share a contact? Create a vcf file containing all my contacts and their info. Numbers, email addresses, etc. Everything I have on their contact cards. After I create the vcf file, I can then upload it to Box. I try to update my Contacts vCard from time to time to include new contacts. So you want to backup your contacts? Yeah. On a vcf file. That way, if I somehow lose all my contacts, one tap adds them back in. 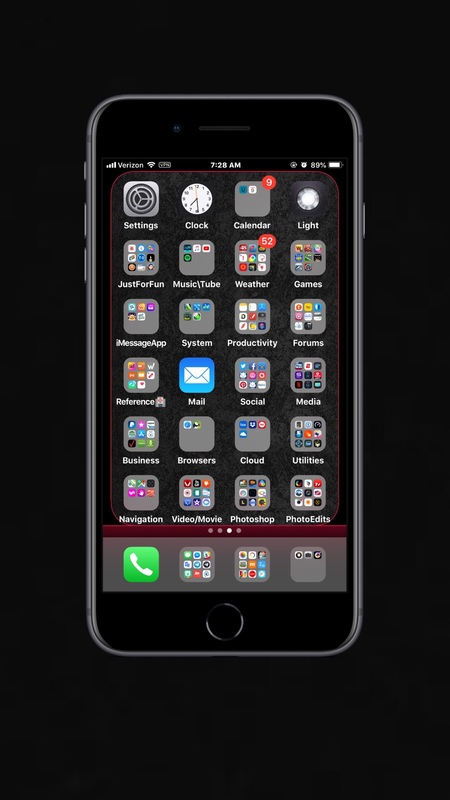 This works pretty good for showing the lockscreen or homescreen on an iPhone frame. You get just the png image of the iPhone. If you want it on a background, you have to do that in Superimpose or some other app. Here I put my homescreen on a black background.